It is exactly what you would expect of Colonel Gaddafi's lair – sumptuous, expensive and utterly tasteless. And a week after the dictator's guards fled his opulent hilltop palace, the Libyan people have given it their verdict by joyfully trashing the place. However enough remains of its former splendour to offer a fascinating glimpse inside the summer retreat of the hated despot. Nestling in the hills above Al Bayda, north of Benghazi, the villa's year-round breeze must have been perfect for hothead Gaddafi to chill out. The 40-room villa, swimming pool and landscaped gardens are a picture of tranquillity. But the real story of the paranoid dictator is to be found in his nuclear bunker, buried in the hill deep beneath the palace. Down a long set of steps and through no fewer than three nine-inch-thick blast doors lies a vast subterranean labyrinth of reinforced tunnels, en-suite bedrooms and caverns full of equipment. It is a nerve centre that would do justice to any Bond villain. The craven fears which must plague Gaddafi's inner circle are obvious from the fact that the bunker has everything needed to sustain life for several months cut off from the outside world. However even in an emergency, it is clear the 69-year-old despot had no intention of slumming it underground. In one room is a cream-cushioned massage table where he could unwind - with the assistance, perhaps, of his Ukrainian nurse or one of his 40 female security guards. Elsewhere, the eccentric madman even had a special button installed on the wall next to the toilet – to summon a waiter. Quite why such a need would ever arise is far from clear, but there the button is - depicting a servant proffering a tray of drinks - perfectly positioned within reach of anyone sat on the loo in the master bedroom suite. Along passageways and through further sets of blast doors, the bunker contains a sophisticated life-support system, with power generators and an air filtration system that looks designed to supply fresh air in the event of a chemical weapons attack. The underground bunker contains seven bedrooms - three of them en-suite - and a large kitchen, plus a network of passageways and tiny openings which lead eventually to an escape shaft into the countryside. Eerily, the rolling green hills surrounding Gaddafi's summer palace - with views of the sea - are reminiscent of the English countryside, with trees, hedges and meadows and silence apart from the sounds of the wind and birds tweeting. The villa itself is a preposterous combination of luxury and chintz. Looters have taken great pleasure in ransacking every room and torching the building, but amid the charred remains are gaudy golden ornaments and intricately carved wooden picture frames. The grand fireplace is flanked by tall columns festooned with gold-leaf ivy. Sumptuous it may be. Stylish it isn't. 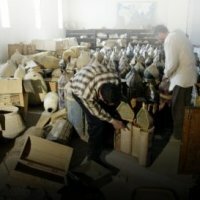 Yesterday, curious Libyans were picking their way through the debris in awe at Gaddafi's warped extravagance. For many photos see the original article.